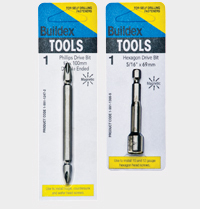 Buildex® offer a full range of drive bits and sockets designed and recommended for use with all Buildex® fasteners. Buildex® Hexagon sockets have been uniquely designed to accommodate the Climaseal® coating on the Hex head of their screws. Combining this with their distinctive chamfer manufactured into the face of the socket, to help with transferring end load directly onto the shoulder / surrounding washer, preventing damage to the coatings. The magnet within Buildex® sockets does not touch the head of the screw and in turn not damage the coatings on the head of the screw. For use with Buildex® Button Head, Wafer Head, Pan Head, Bugle Head Csk Head, Csk Rib Head, SEH Screws and Wall-Mates®.